The three primary Cosmo costumes over the years. Chronological from right to left. BYU President Ernest L. Wilkinson as Cosmo in 1960. 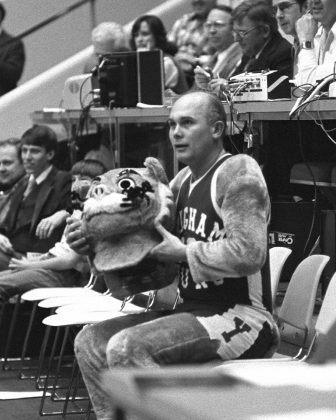 President Dallin H. Oaks as Cosmo Basketball - BYU vs Colorado State February 24, 1979. BYU VS. University of Utah Stadium Ground breaking, Cosmo Nov. 21, 1981. BYU Football vs Southern Utah University in 2016. 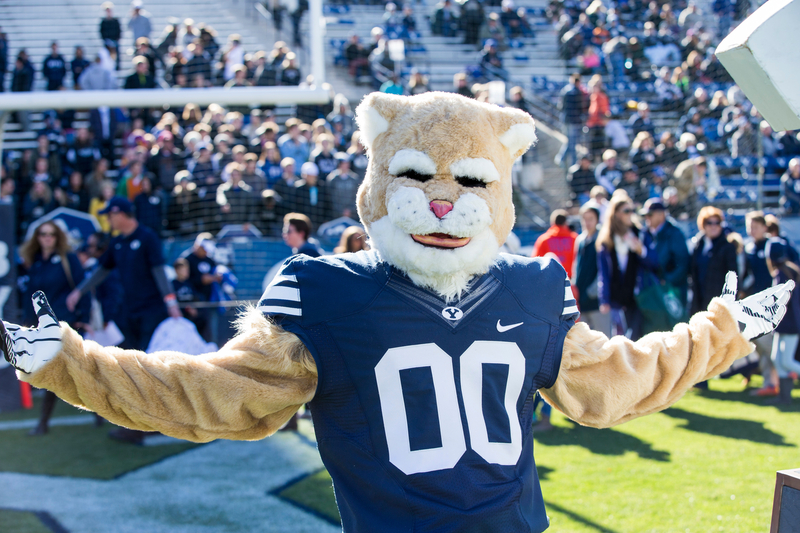 BYU’s beloved mascot Cosmo the Cougar is known for his flips, tricks and impressive dance moves whether he’s making appearances at sporting events or performing viral dances with the Cougarettes. Cosmo’s look and costume have changed drastically over the years, but no matter who is inside it, the excitement it brings to every event remains constant. BYU’s mascot got its name after BYU was named a “cosmopolitan” school in 1953. Now, several decades later, Cosmo is as popular as ever, begging the question, “Who is Cosmo?” While there are many guesses and assumptions, his identity remains a mystery. Cosmo gets its start with a tryout on the dunk team. After years of training, the best are picked to wear the costume — usually a senior. According to several sources, many students play Cosmo since there are numerous appearances each year. The first person to play Cosmo was Daniel T. Gallego in 1953. The costume reportedly cost $73. 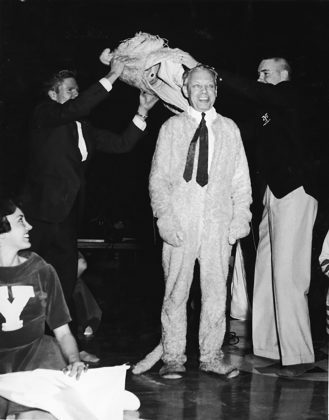 During the ’60s and ’70s, university presidents Ernest L. Wilkinson and Dallin H. Oaks donned the Cosmo costume and then revealed their identity during school gatherings and sporting events. Wilkinson was inside the costume in 1960, and President Oaks played Cosmo at a BYU basketball game in 1979. Former BYU football coach LaVell Edwards was Cosmo when the Cougars hosted Utah in a basketball game in 1981. Today’s Cosmo is very athletic; however, for the first 40 years, Cosmo wasn’t allowed to do any flips or tricks. The main role was to simply jump and cheer. 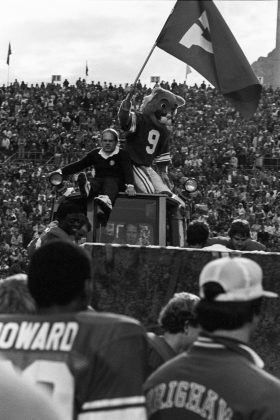 After a touchdown in 1980 at the “Miracle Bowl” against Southern Methodist University, Cosmo ran to the end zone to help the referees pull players off of tight end Clay Brown. Beginning in the 1990’s, simple interactions with the crowd caused some technical difficulties with the early Cosmo costume. It was big and bulky and restricted simple movements like turning its head. Cosmo underwent some major costume design upgrades to help fix these problems in 1997. Cosmo now has a full range of motion and improved sightline. The Cosmobile — the mascot’s van — helps Cosmo maintain secrecy by giving the mascot a place to prepare and get dressed for events in private. When Cosmo is getting ready for home events, it has its own changing room in the Smith Fieldhouse. There are four different costumes, allowing Cosmo to have everything packed and ready for his next event while having a fresh, clean costume to perform in. There are nearly 600 events for Cosmo per year with up to a dozen events per week. Football and basketball seasons include larger events, which take a great deal of time and effort to prepare for. 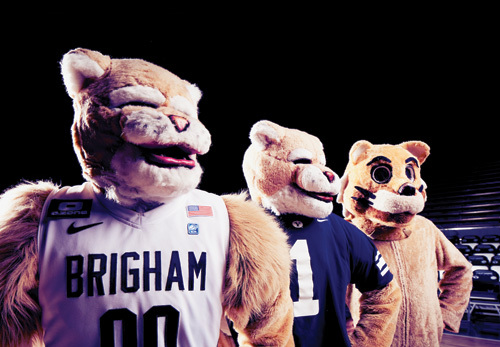 The university wants Cosmo to be a character, an important part of BYU, not just a person playing a mascot, so the people who wear the costume are under strict rules to not reveal their identity during their time as a student, though some have come forward afterward to reveal themselves. Aaron G. MaGavock was Cosmo from 1999 to 2001 and went on to be a professional mascot for the NBA, AAA baseball and the UFL. McGavok described his last experience as Cosmo as the most memorable. After his name was read, McGavok ran to the changing area in the Smith Fieldhouse, quickly changed and got back in line with the graduate students. McGavok said BYU has always kept the identity of the mascot under wraps, explaining that not even his parents knew until he went home for Christmas and had knee surgery for a Cosmo-related injury. Matthew Richardson, current BYU advancement vice president, was McGavok’s bishop at the time and was one of the few who knew the secret, outside of his roommates and the cheer squad. Rich Summers, who replaced McGavok as Cosmo from 2001-2004, said the closest comparison to being a mascot is dressing up for Halloween. Summers recalled one of his favorite memories as Cosmo at the rivalry basketball game against the University of Utah in December 2003. 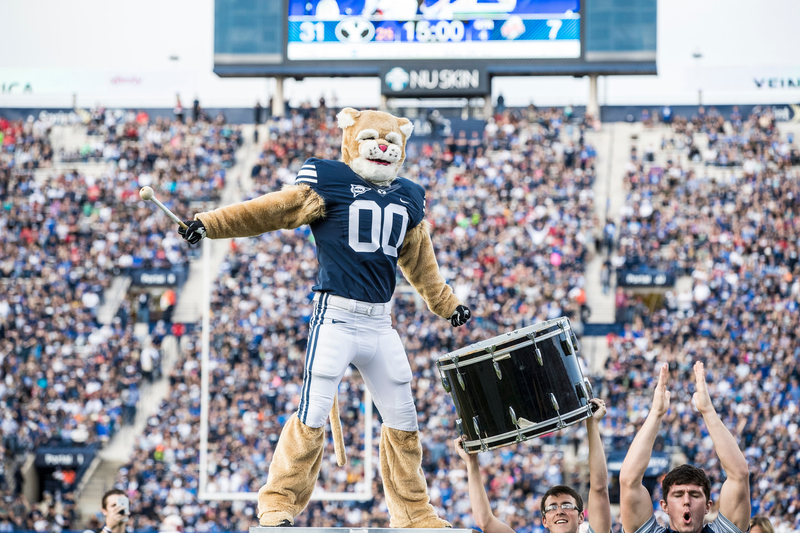 Cosmo received huge publicity for his dance moves with the Cougarettes during the halftime performance at the 2017 homecoming game against Boise State, when he did a collaboration to the song “Rolex” by Ayo and Teo. After the song, the entire LaVell Edwards stadium erupted and the iconic performance went viral. Cougarettes coach Jodi Maxfield elaborated on the collaboration and what she looks for in Cosmo. Maxfield said much time was spent in preparation leading up to the performance on the field. On Jan. 27, the Cougarettes once again performed with Cosmo and the original artists, Ayo and Teo, during halftime at the BYU-Pacific basketball game. The Marriott Center was packed, and the performance didn’t disappoint. They originally tried to schedule the performance during the football season, but couldn’t find a game when Ayo and Teo were available. 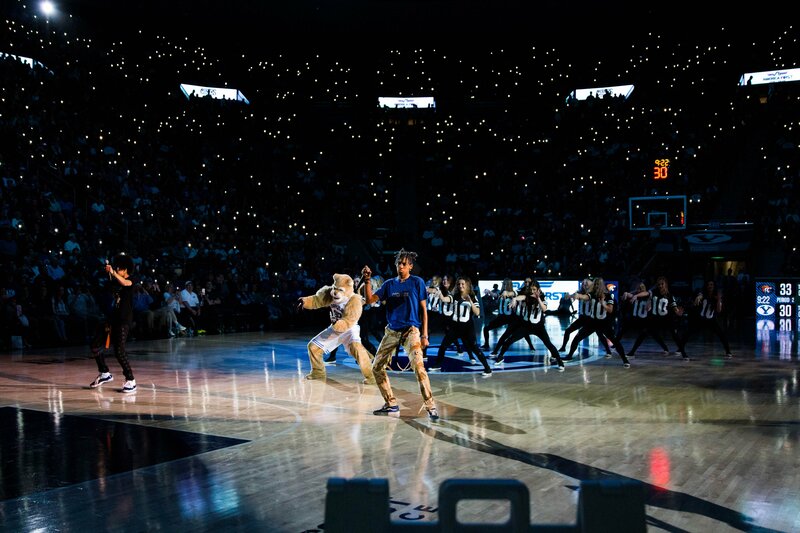 In addition to the Cougarettes, Cosmo regularly collaborates and performs with the BYU Dunk Team, where he shows off more acrobatic and challenging tricks. Beyond the dunks and tricks, the team admires the impact Cosmo has on the community, bringing joy into people’s lives. They added that Cosmo can go from entertaining thousands at a sporting event, to focusing on the individual when visiting children in hospitals.